Doc Neeson covers Flash and the Pan’s “Walking In The Rain” for new single. The Angels front man Doc Neeson’s new single is a cover of Flash and the Pan’s “Walking In The Rain”. The single is Neeson’s first studio recording in 7 years. Doc’s recording was produced by ARIA Award winning producer Brendan Gallagher. “When discussions began between RocKwiz producers and Alberts about the iconic Australian songs and suitable performers, the idea of teaming Doc’s mellifluous voice and the speak-style of ‘Walking In the Rain’ was ignited. “The strength of the song written by George & Harry is dreamlike or trancelike in mood. The lyrics are a stream of consciousness which so masterfully creates a subconscious state of mind. One of the biggest challenges was to get in that state of mind to sing the song,” said Neeson. “The song is so elegantly, deceptively simple. The motif moves through three chromatically rising and falling notes underpinned by three book-ended chords, then a classic 7, 5 chord turnaround for the chorus. The bass holds the song together. From there it’s all about the vocal. That’s where Doc comes in. Doc has gravitas the equal of the song’s majesty, “said Gallagher. Along with Neeson’s vocal delivery, Gallagher had a few ideas in the back of his mind that he introduced to the recording of the song. Doc Neeson ‘Walking In The Rain’ available now from iTunes. The Best of The Easybeats and Stevie Wright’s Hard Road to be reissued on the Australian RSD. 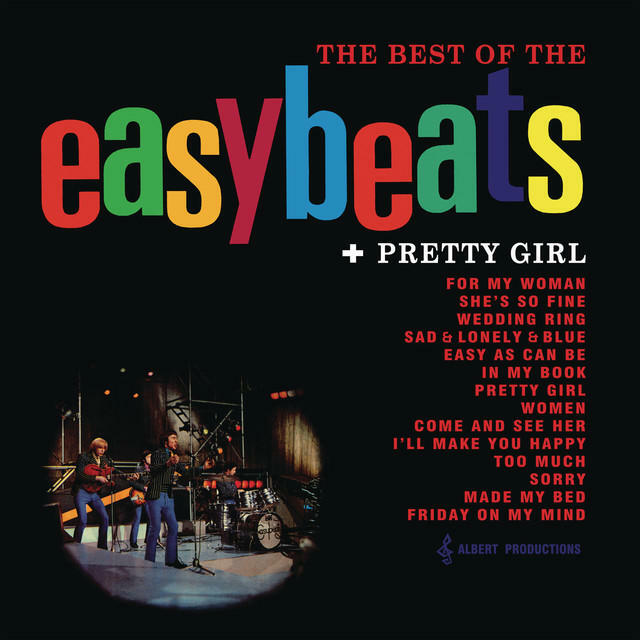 For this year’s Record Store Day Australia event, Sony Music and Albert Productions will be reissuing the 1967 Australian/New Zealand compilation album The Best of The Easybeats + Pretty Girl. The best of album will join four other classic albums from the Albert Productions productions catalog: Stevie Wright’s debut solo album Hard Road (1974), the Vanda and Young produced self-titled Rose Tattoo (1978) and The Angels’ Face to Face (1978). All albums have been remastered by Don Bartley and are pressed on 180gm vinyl. Unfortunately for those readers outside of Australia and New Zealand – these albums are only available in Australia and New Zealand. There is no word yet as to whether they will be released post RSD. EASYS, STEVIE, ANGELS & TATTS RE-VINYLED! Four seminal Australian albums THE EASYBEATS The Best of The Easybeats + Pretty Girl (1967)STEVIE WRIGHT’S Hard Road (1974) THE ANGELS’ Face To Face (1978) and ROSE TATTOO’S Rose Tattoo (1978) headline ALBERT PRODUCTIONS’ vinyl reissues series. The classic albums, revered and influential from release, are scheduled to be released on high quality, 180 gm vinyl for maximum dynamic and authenticity. Renowned mastering expert Don Bartley painstakingly converted the original analogue tapes to new vinyl masters, on vintage and retooled analogue studio gear. The albums will be available world-wide through Albert Productions via Sony Music Australia on Record Store Day, April 19. Enthusiasm for the series was summed up by Angels’ lead singer Doc Neeson. ‘Good old analogue vinyl’ is back to the future after three decades of consumer fascination with digital technology. As compact disc was introduced in 1982 and mp3 players appeared in 1999, vinyl became the preserve of dedicated music buffs. Around 2009 however, a new generation of vinyl buyers appeared, attracted by the fullness and ‘warmth’ of analogue sound … and to the 12” album cover art … and to the tactile rituals of placing the record on a turntable … and dropping the stylus into the grooves while reading informative information on the artist and the production of the album. What was a blip is now a surge. Ted Albert, Australia’s legendary music visionary and fourth generation scion of the successful Australian music publishers J. Albert & Son, launched Albert Productions in 1964. 2014 marks the venture’s 50th anniversary. Albert Productions got off to a flying start with a barrage of #1s from Billy Thorpe & The Aztecs. Ted Albert then discovered, fostered and recorded The Easybeats – the first Australian rock group to make international charts. From 1974 to 1979, with Easybeats guitarists Harry Vanda and George Young songwriting and producing, Albert Productions dominated the Countdown pop era, occupying an amazing 20% of the Australian singles charts – with at least 4 tracks in the Top 20 at any one time. From the mid-70s onwards, Albert Productions was integral to the growth of Australian pub rock; signing seminal rockers AC/DC, The Angels and Rose Tattoo. THE EASYBEATS – Best of Easybeats + Pretty Girl – Ted Albert produced the band’s astonishing run of seven Australian Top 10 singles (four of them #1) from 1965-66. After relocating to London, The Easys linked with The Who and The Kinks producer Shel Talmy for “Friday On My Mind” – another Australian #1, Top 10 in the UK and Europe and Top 20 in the USA. Pretty Girl, another prime cut of direct and driven R&B, was also produced by Talmy. STEVIE WRIGHT – Hard Road – The debut album for The Easybeats singer and teen heart throb, all grown up and battling inner demons. Former Easybeats guitarists Harry Vanda and George Young produced and wrote the biographical title track. Undoubtedly the album’s showcase is the Vanda/Young 11 minute rock suite Evie (Pts 1-3) which traces a relationship from young lust to pensive joy and, finally, soulful heartache. Wright penned 6 tracks, varying from the sunny Life Gets Better to the swagger and scream of Commando Line. THE ANGELS – Face To Face – is the controlled dementia of urgent guitars, ferocious rhythm, chanted choruses, overlaid by singer Doc Neeson’s incantations of anger and despair. Inspired by the nihilism of German Expressionism; Face To Face mirrored youth disenfranchisement in late-70s Australia. Thirty six years later, the rush of Take A Long Line, the brutal beat of Comin’ Down and the fervent I Ain’t the One still reflect societal alienation and will likely continue to do so forever. ROSE TATTOO – Rose Tattoo – Formed by virtuoso slide guitarist Pete Wells and produced by former Easybeats Harry Vanda and George Young, Rose Tattoo is an avalanche of hard, heavy, fast, crunching rock ‘n’ roll. Chicago blues and working class boozy roots show through on Rock ‘n’ Roll Outlaw and The Butcher and Fast Eddy. Nice Boys is pure adrenaline, while the irresistible throb and swing of the Top 20 single Bad Boy for Love later influenced the formation of Guns N’ Roses. While The Easybeats had Friday on their mind, RocKwiz have Monday on theirs when the new season launches on Monday March 24 with a special episode saluting Australian songwriters Harry Vanda and George Young. Season 12 kicks off with a live show recorded at Sydney’s Enmore Theatre in December last year where RocKwiz paid tribute to Alberts writers Vanda and Young – Australia’s most famous songwriting and production team. From The Easybeats to Flash and The Pan, to producing material for The Angelsand AC/DC, Vanda and Young were responsible for some incredible music. This special episode pays loud and loving tribute to an important slice of our musical history. Joining the delightful Julia Zemiro, charismatic showman Brian Nankervis, beloved human scoreboard Dugald and the RocKwiz Orkestra, are a cavalcade of stars including Doc Neeson (The Angels), Isabella Manfredi (The Preatures), The Basics (the band featuring Wally De Backer aka Gotye), Steve Kilbey, and Gossling to name just a few.